Humboldt County’s Republican Party will honor local and national political veteran Peter Hannaford at its 22nd annual Republican-of-Year Dinner, Saturday, March 29. Hannaford was chairman of the Republican County Central Committee in 2011-12. He was Assistant to the Governor and Director of Public Affairs for then-Governor Ronald Reagan in the mid-Seventies, He was co-director of issues and research in the Reagan 1976 presidential campaign; and communications adviser to the candidate in the 1980 campaign. Earlier, he worked on several local and legislative campaigns in Alameda County. In 1972, he was the Republican candidate for the U.S House of Representatives in the then-Seventh District. According to Republican County Chairman Todd Walker, the party will honor Annette DeModena as Volunteer of the Year at the dinner. She is also the current president of Humboldt Republican Women Federated. Invitations are in the mail for the dinner which will be held at the Ingomar Club. Reservations are required for this Invitation Only Event. ◼ You can pay for tickets using our secure online Piryx link, HERE. 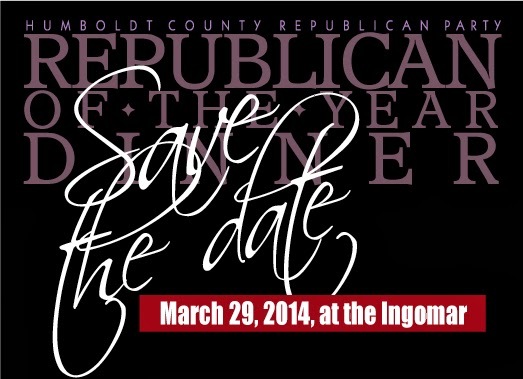 For more information, please call Jane at (707) 442-5602, or call the Humboldt GOP Headquarters at (707) 442-2259.